It is Holiday shopping season! Don’t believe me? Well, when the big box stores already start their Holiday layaway programs, you know it is time to get ready for the holidays! So, are you wondering what are the hot toys for 2016? What are the best Tech toys for 2016? The coolest STEM for the season? What to get your toys are best for toddlers or teens? What will be the most popular toys for Christmas? Then you have come to the right place! Here are the top picks for Tech toys. These toys definitely require batteries or wall outlets, but they offer amazing play value and have also been picked because they show the amazing technological advancements in Toys! 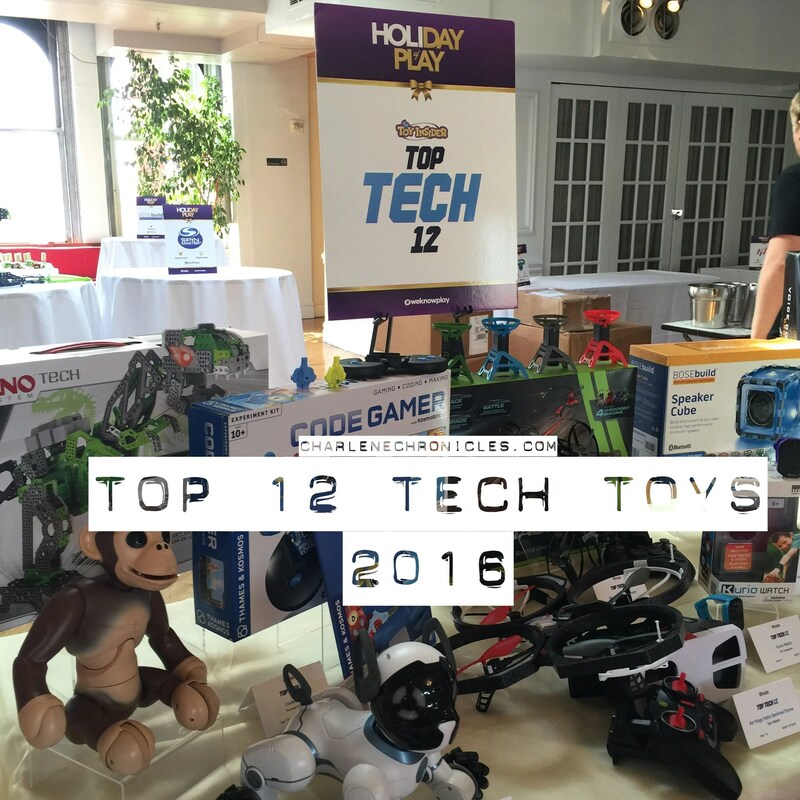 So take a look, and don’t forget to see the 20 Hot Toys and the Top 10 STEM Toys for 2016 too! The Air Hogs Helix Sentinel is a first­person view video drone that allows kids to connect multiple devices to stream live video. The built­in high­speed camera allows kids to capture fast moving objects, which they can store on the included 4GB memory card. The FPV goggles give kids the chance to see things from the drone’s perspective and the carry case makes sure kids can easily bring it with them to any destination. Go high­tech with the world’s first smart dollhouse ­ Barbie Hello Dreamhouse! This two­story home has innovative features designed for a modern girl and reflective of the next wave of innovation in the home. ￼￼elevator. An accompanying app allows further customization. imagine, customize, and control their house play. The BOSEbuild Speaker Cube uses high­quality parts and materials for durability. It’s easy to build, too. Its instructions involve discovery and education – from how a simple magnet and coil make sound, to how a speaker reproduces music. favorite songs in an instant. CHiP (Canine Home Intelligent Pet) is the ultimate AI Robotic Dog. CHiP recognizes its master and responds to commands using the included SmartBand, a sleek, rechargeable wearable controller. CHiP also responds to hand gestures and voice commands. CHiP plays fetch and fun games with his SmartBall, interacting in all the ways a real dog would… Roll his ball and he’ll bring it back to you, or play soccer with him. Pick up his front legs and he’ll dance with you. Rub your nose against his and he’ll nuzzle right back. welcome addition to today’s connected home and fun for all ages. This kit introduces kids to programming in a fun, step­by­step way. An Arduino­compatible gamepad connects wirelessly to a tablet. Using the gamepad and four interchangeable sensor modules, kids play through a video game app. forward in the game. In this way, kids progressively learn the basics of coding. This Bluetooth smartwatch is made specifically for kids and features a sleek, modern design with smooth rounded edges, an adjustable soft silicone band, and a responsive touchscreen with excellent resolution. within a safe distance using Bluetooth technology. hands­free way for kids to take phone calls. blood type, any allergies and an emergency contact. LUMI provides exciting drone action while taking some of the fuss out of flying an indoor quadcopter. LUMI can literally fly itself while kids play, direct and command it using the app. ￼With a smartphone or tablet, kids can select one­touch stunts, follow­me mode, or simply take control and fly LUMI with ease, while obstacle avoidance technology helps LUMI avoid your walls and furniture. Various single and multi­player game modes include challenging the player to follow sequences of flashing lights while LUMI flies and dances in the air, reacting to your performance. Players can choreograph a series of flight moves and play them back to music selected from their music library and also save and share their programmed airshow with other LUMI users. With endless ways to play, Mebo fosters STEM skills and creative open­ended play. Control Mebo through an intuitive, free to play app for iOS and Android devices. Drive Mebo anywhere in the house to pick up snacks, spy on people, or even have conversations with them. See what Mebo sees with the built­in POV camera, which streams live in HD. Lift and move items precisely with Mebo’s articulated arm and gripping claw. Speak through Mebo with the two­way audio and microphone, listen in on others, or even play music. Six wheels let Mebo turn on a dime, and go anywhere as directed. Connect directly to Mebo’s hotspot to access Mebo remotely. Bring Mebo’s personality to life with a custom sequence designed from pre­set animations like 360­degree spin, head shake and arm wave! Meccasaur is an interactive 3­foot long dinosaur that kids build and program using metal and space­age plastic pieces. Use Room Guard mode to protect your stuff. If Meccasaur notices any sounds or change in light, he’ll charge at the intruder while roaring. Meccasaur responds to petting, answers yes/no to questions, and stomps around. Sky Rover responds to 12 commands when spoken through the included headset. Simply say “take­off” and watch as your drone changes direction and does amazing stunts like 360° flips all in response to your verbal commands. ￼drone is perfect for all levels of flyers. The Hover Racer combines drone racing with video game battling. This one­of­a­kind racing drone flies 20 mph while hovering 3 feet off the ground, and offers a huge variety of gameplay for up to four players. Using the free­to­play app and infrared beacons, players race and battle in a course of their own design. As players improve, they can unlock stronger weapons, and increased performance, to gain the edge in multi­player racing and dogfight battling. With lifelike movements and realistic chimp sounds, Zoomer chimp is the closest kids can get to having their own chimp. Zoomer Chimp can follow you, stand up on his own, and recognize commands through his voice recognition technology. He loves to perform tricks – using voice commands like: “Stand,” “Sit,” “Go Bananas,” “Do a flip,” and more. See what all my Toy Insider Parent Panel posts and my toy reviews here!